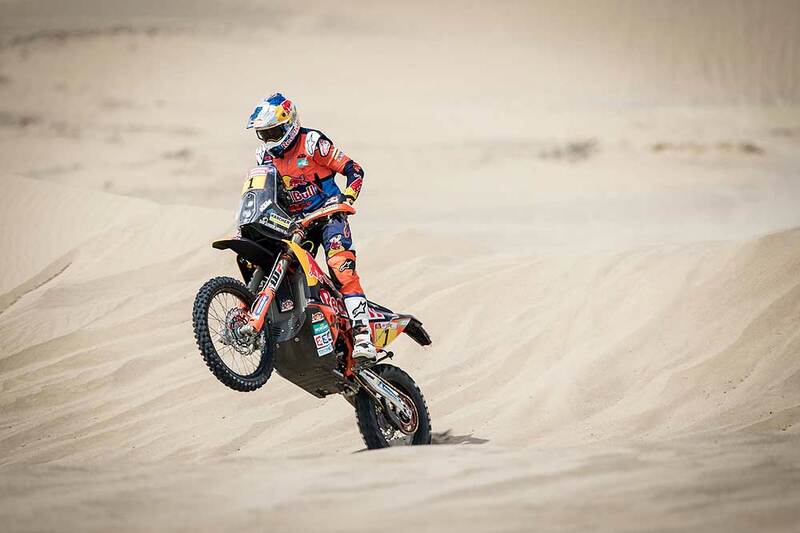 British Sam Sunderland got his 2018 Dakar Rally off to the perfect start with a commanding win on the short 30km special stage in the dunes just outside of Lima, Peru. The Brit, carrying the number-one plate on his KTM 450 RALLY, took the win by 33 seconds from second-placed Adrien van Beveren (Yamaha). Sunderland was the final motorcycle rider to set off on Saturday, but got his title-defence off to a great start. 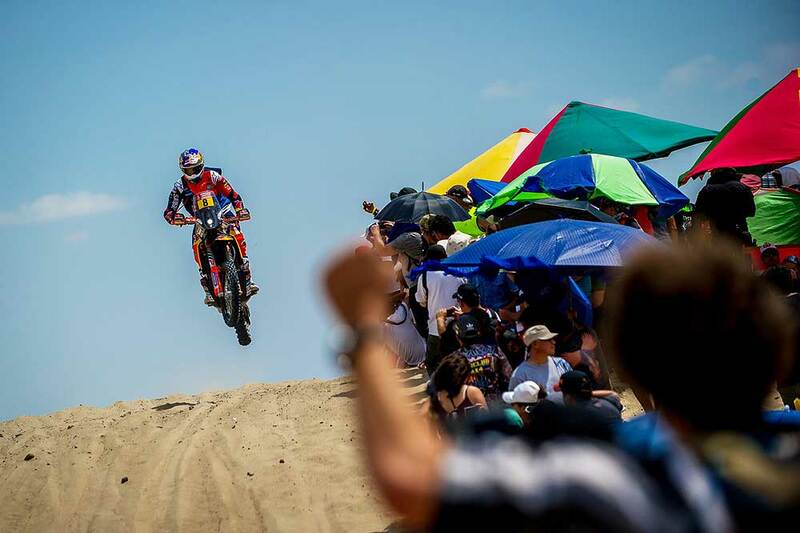 The 2017 champion rode a fast, but risk-free stage and was pleased to open his 2018 Dakar Rally with a win. 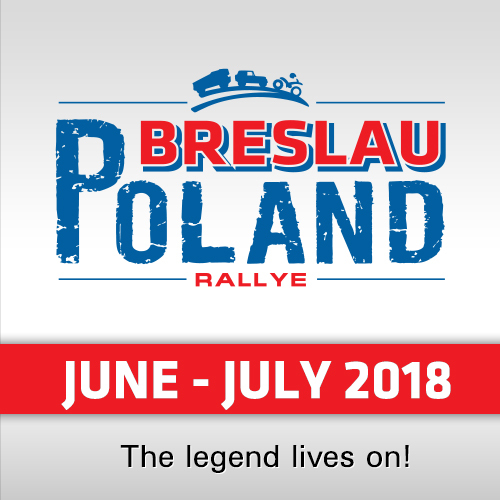 "I had a great time today, the departure podium was good fun, then we had a 200km liaison to the special," the Brit reported. "The 30km loop through the dunes went well – the bike felt good and I feel really comfortable. Although it was just a short one, it’s always good to get a stage win. Sunday will be tougher, but if I can stay consistent and not make any mistakes I’m hoping for another good result." Matthias Walkner’s opening day wasn’t without drama. The Austrian had a scary moment on the liaison section following an incident with the local traffic. His rally nearly ended no sooner than it had started. Despite the scare, Walkner went into the special stage with good pace and finished in a strong sixth place. "Today went well, it was a tough stage to ride because the sand is so soft," said Walkner. "With the whole day being off-piste, navigation was a little tricky, too. I got a few lines wrong but overall I tried to stay safe and not take any risks. I am happy enough with the result, to finish inside the top-10 on such a short stage is always good. Today was a nice little wake-up for what is to come." Returning to the Dakar after missing the 2017 event, Antoine Meo also impressed with his top-10 position on the opening stage. The French ex-world enduro champion continues to impress: "I’ve had a really good day. To come back to the Dakar after so much time off the bike was always going to be hard. Your whole body is under stress here, including your mind. 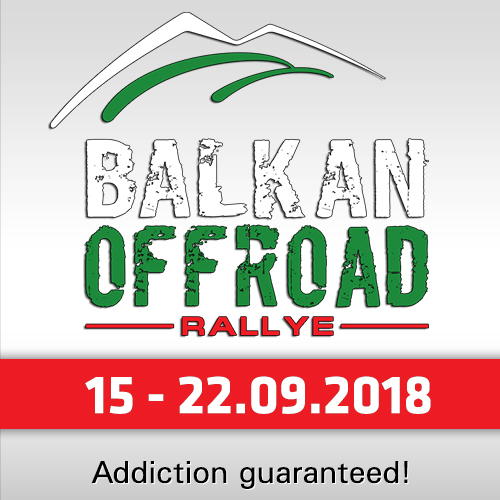 The first stage was short but I’m pleased with how it went – I made a little mistake but I feel good and I’m looking forward to Sunday," he said after the stage. Laia Sanz from Spain put in an incredible performance on day one. The multiple world enduro champion, although cautious through the mountainous sand dunes, navigated the stage perfectly and posted a very impressive time that secured her 12th position, just over three-minutes behind her team-mate Sunderland. "I am happily surprised with my result today," said Laia. "I wasn’t pushing too hard because it was very difficult to read the dunes at the start of the stage, and it was really easy to make a mistake. There was some tricky navigation, especially one waypoint, but I found it quite quickly and managed to get to the finish in good time. Today was only 30km, so I think Sunday’s stage will be really demanding but I’m still looking forward to the challenge." 2016 Dakar champion, Toby Price, was happy to complete the first stage safely. Only now returning to competition following the injury sustained in last year’s event, Price rode well, minimising any risks to post the 14th fastest time of the day. 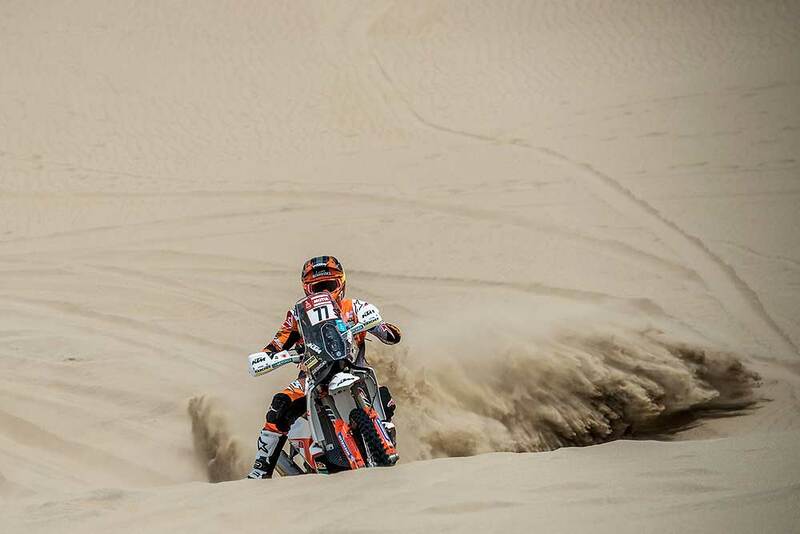 KTM Factory Racing’s Luciano Benavides got his first ever Dakar off to a great start. The Argentinian finished in a very creditable 16th place, just two places behind Price. 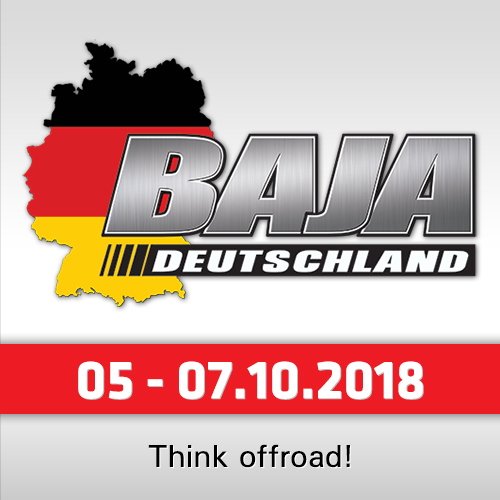 With two weeks of the toughest cross-country rally ahead of him, Benavides plans to take each day as it comes and continue to learn and build on his experience.